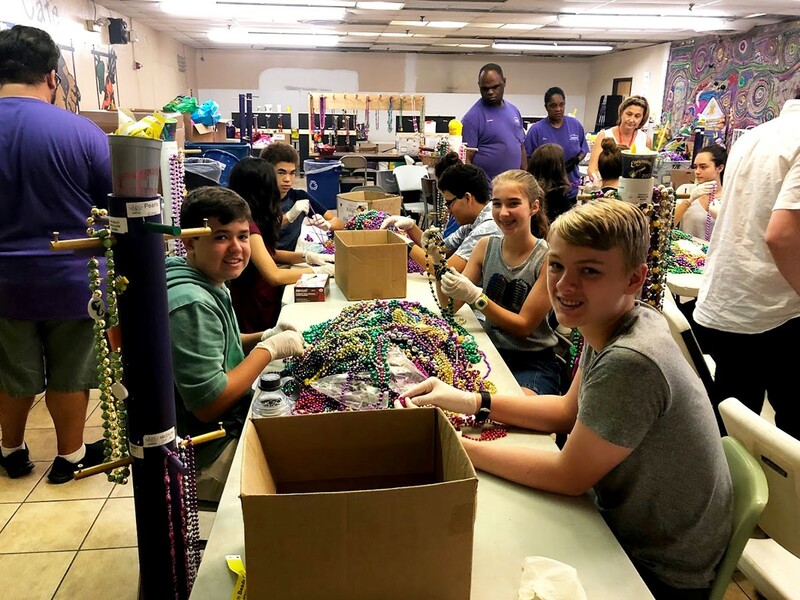 (On left) Casey Carter, Sierra Leo and Andreas Cantu and (on right) Tyler Block, Brandon Shin, Josephine Gregg and Blake Peterson sort beads for The Arc, a Community Service center that works with volunteers to sort and recycle beads for New Orleans’ next Mardi Gras festival. The first few weeks of school are infamous for being nerve-racking to new students. Sure, people are nervous about the academics. For me, however, more significant is the fear of not fitting in socially. Getting to know people is hard, and it is even harder for people who have recently transferred into a school. I have been through the introduction process before, but never in the way that the Post Oak High School does it. Instead of having students pick a random seat in the cafeteria and hoping everything works out, or going through the dreaded, “Okay, everybody go around and say three things about yourself,” the Post Oak High School arranged a school-wide bonding trip to the city of New Orleans. I was slightly nervous beforehand but, nearly the moment the trip began, my nerves started to dissipate. I got to know a bunch of kids who were in the same groups and activities as me, and the city itself was a fascinating place. Each street corner was filled with shops selling colorful items, and signs ranging from Voodoo endorsements to advertisements for Ghost Tours. Our teachers put in a lot of effort to make sure we could experience the city to its fullest for the short time we were there. Our days were packed with various activities. We visited the New Orleans Bayou and got to hold a baby alligator, followed by trying many examples of the city’s cuisine. We even got to end one of our nights learning about the incredible legend and backstory of New Orleans by taking a tour discussing paranormal aspects of the city. Learning the context behind different places really helped enrich our experiences throughout the trip. Overall, I had an amazing time, and the trip left me excited to see where the Post Oak community could take me within the city of Houston.